As of right now there are no firm plans (that are public anyway) as to her rebuilding. 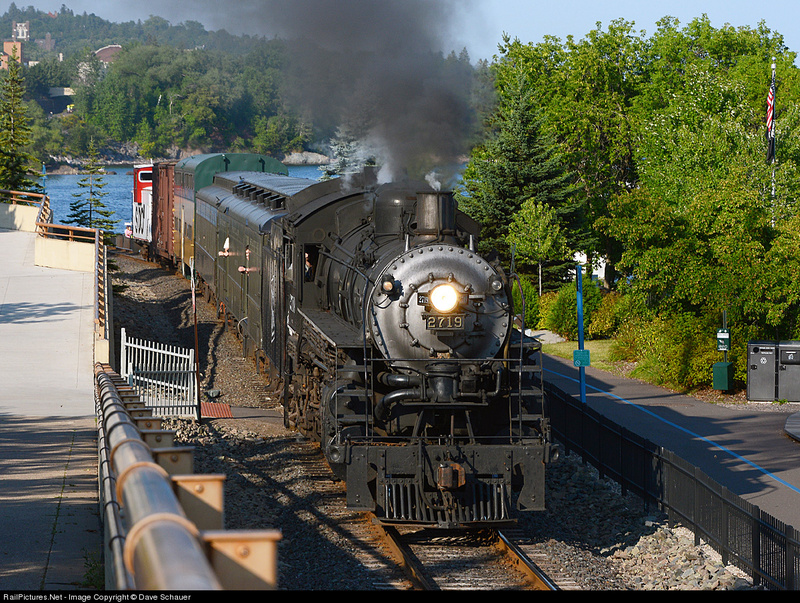 The locomotive is owned by the Locomotive & Tower Preservation Fund and is leased to the Lake Superior Railroad Museum for operation. This year has been somewhat bittersweet for me, as I finally had a chance to start getting some throttle time on the locomotive under the watch of the North Shore Scenic Railroad's veteran engineers Frank Christopherson and Ernie Andrys. Not many 25 year olds can say they learned to operate a steam locomotive from an engineer with 53 years of service on the Great Northern, 10 of which was on steam exclusively. This forum is often focused on the preservation of objects and equipment, but I'm curious how those who operate steam on a regular basis go about preserving the teachings of steam; How to start a heavy train without slipping the drivers, how to keep steam moving to the cylinders even when drifting to avoid rod clank, how to determine proper valve settings, How to switch with a high driver passenger engine and even how to make a locomotive sound like its' working its guts out when just drifting along. The second photo of 2719 as Iron Range 403 is amazing! All the details are right in terms of what vintage and heritage railroading should look like--black steam engine, Pullman green passenger cars, both just a little dusty from work, jointed rail, just the right amount of smoke. . .too bad the party's over for now, at least. I live in the wrong time. And I'm not the only one to say so; at least two friends say I do. It's one thing for you to think you live in the wrong time, but another when your friends point it out as well. Thanks, J3a-614, for the nice comments about my shot of Soo 2719/DM&IR 403 at Marbles with DM&IR combine W-24 and coach 33. You might be interested to know that it was a group effort to Missabe-ize 2719 for the Lake Superior Railroad Museum's Railfan Weekend 2013, organized by author and photographer Steve Glischinski. The tender herald, cab numbers, and sand dome numbers are owned by the Missabe Railroad Historical Society and were loaned to the LSRM for the event. They were attached to the 2719 with double-sided tape and black duct tape. The headlight is real DM&IR - it's off of Duluth & Northeastern 2-8-0 28, which started life as Duluth, Missabe & Northern 332. Bob Purcell and Steve Louze of the Cloquet Terminal did us a HUGE favor by removing 2719's headlight and installing 28's in its place; I had the glass cut for new numberboards, which were made in my garage a few weeks before the event. The white trim on the lead truck, as well as the paint on the main rods, side rods, and eccentric rod is nothing more than white poster paint that will spray off with a little soap and water. The resulting effect was much better, I think, than many of us expected. It really looked like a DM&IR Pacific! Modifications to the 2719 took several hours. The bigger job was converting the museum's Alaska RDC into "DM&IR 1," which was used on the Lakefront Line (the tracks used by the North Shore Scenic Railroad) from 1953 until 1961. New lettering was made by Steve G. at a cost of several thousand dollars, and temporary white and red striping was added on one end. All I can say is WOW! You guys sure went out on the 1472 with a bang! I also like the second photo of the 27...uh,...er,...I mean the 403! Nice angle--gives the viewer a real sense of size and scale! Also, it could easily pass for a photo taken over 75 years ago! Real classic! I also like the traditional crew pose! The care and pride these fellows take in their engine really shows! Just out of curiosity, when did Yellowstone 224 get the new coat of paint? The care and pride these fellows take in their engine really shows! Much appreciated. The locomotive is currently in the shop being drained and prepared for winter storage inside the railroad museum, so even if she doesn't begin the teardown process soon, she'll be well cared for until the time is right. 229 was repainted last year. She is the only surviving "war-baby" M4 Yellowstone, 225 and 227 are M3s. What's the apparatus in front of #2719 under the smokebox with the pipes coming out of it? Never took notice of it before, nor have I seen this engine in person. 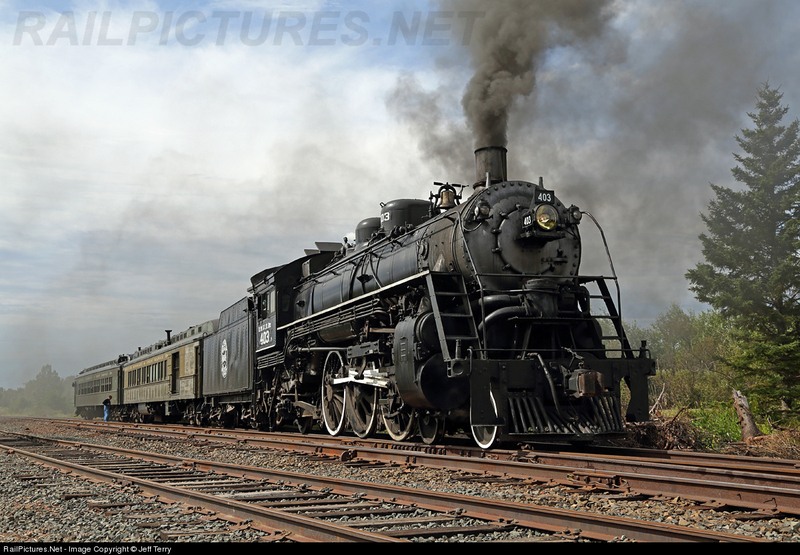 Are there thoughts /hopes of getting her back in steam like IRM Frisco #1630 or is it expected to sit idle like Frisco #1522? That engine did look just right. Wish I had known about it. I'm afraid to admit I wasn't aware of your operation until this post. We don't get no respect! I noticed the trolley wire over the track in the group photo of the crew, so I checked the museum's well-done website and found a photo of their ex-Lisbon streetcar. Then I rechecked the photo and, as I suspected, an extra rail, because Lisbon trams are narrow gauge. There were also photos of some of the static displays, including a very impressive 2-8-8-4. Next time I'm in the area, that museum will be getting a visit. You'll like your visit I think. The Missabe 2-8-8-4 (sister to the #229 in photo earlier on this thread) actually "takes a trip" at certain times during the day. Authentic sound and drivers in action! Just missing the coal smoke! The museum is fantastic! I was able to visit the museum this summer with the rest of the Inter modal and Transportation camp I went to, and the entire operation is top notch! The old platforms are filled with restored exhibits and a lot of them offer the chance to walk into and view them. The cab of the Yellowstone is open and you can really get a good sense of how much effort was taken to operate the locomotive! I am very sad to see 2719 down, but she has had a good preserved life! I got to see her just after she had undergone her final hydro. Hopefully her worn out body can undergo another restoration! I'm hoping too, that the 2719 is eventually restored to operation. BUT, there is always Soo Line 2-8-2 #1003 in southern Wisconsin that was recently restored. Maybe she could be used in the interim until 2719, or another steamer, becomes available. Cloquet Terminal Railroad. Maybe they will take a good look at her and maybe restore her.